Many popular secular books today explore how embracing gratitude can lead to a happier, healthier life. In contrast, Muto, a renowned author, speaker, and teacher, approaches gratitude from a uniquely Catholic perspective. In this insightful, inspiring book, she explores how life-changing a spirit of gratefulness can be by using both personal and well-known examples of the struggles and rewards of grateful living. Muto and companions such as Julian of Norwich, St. Therese of Lisieux, Henri J. M. Nouwen, and Dorothy Day highlight the power of gratitude as a grace from God and walk with us as we learn to practice thankfulness. A spirituality of gratitude reminds us that, even without the possessions, luxuries, or leisure time society claims are the most important things in life, God still loves, cares, and knows what's best for us. Muto also provides practical tools that help us embrace this grace in our lives. 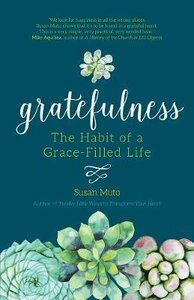 About "Gratefulness: The Habit of a Grace-Filled Life"
Muto is Executive Director of the Epiphany Association, an educational center in the emerging field of lay formation.